It was one of those rare times when I ventured out looking for something in particular and actually found it! Summer isn’t a great season for mushroom hunting but it does have some interesting and choice variety (albeit small) of edible fungi. 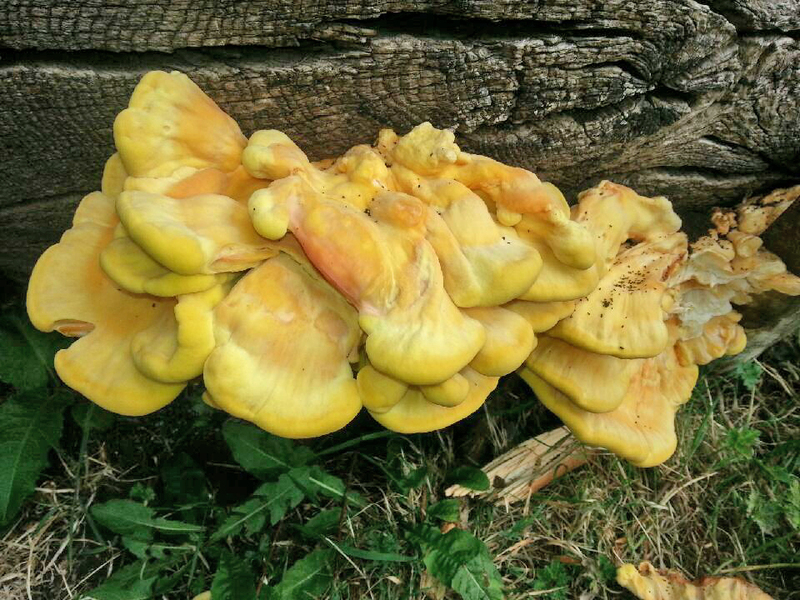 At the edge of a long woodland path in a Leicestershire wood, fortune was on my side when I came across Chicken of the Woods or Sulphur Polypore (Laetiporus sulphureus). One of those bracket fungi that are instantly recognisable and a joy to behold. What I found was a very modestly sized tier of Sulphur Polypore (a common name I seem to prefer). The upper (older) bracket, although still featuring lemon yellow pores on the underside was unfortunately losing it’s full potential of colour on the top side. The younger sprouting shelves though were more succulent and rich in colour, soft and malleable to the touch. Chicken of the Woods quite often grows in high layered formations around a metre or more high, with fanned brackets reaching up to 30-40cm or so in width. But like many fungi and mushrooms, finding it in the prime of it’s life is paramount, not only for identification reasons but (as in this case) for edibility. Instantly recognisable features of this bracket fungus are the bright yellow and orange colours. The very small pores on the underside are a striking lemon yellow and the upper side (depending on age) is more orange yellow (often ridged and wrinkled in shape). With age, the upper surface will lose it’s colour along with the rest of the fungus. Finding it young is a must. The flesh of the younger folds are often quite thick and succulent, ideal for your cooking pot. But even though it looks beautiful and enchanting this fungus is actually a parasite often found on dying oak trees and also on other trees such as sweet chestnut, poplar, willow and yew. But in this case – a cherry tree. Edibility-wise this fungus doesn’t tick all the boxes for all people. Only the young , fresh parts are worth eating. It does have a strong taste which sometimes can be quite acidic and bitter. But it’s all in how you cook it and I’m not a notable chef (unless it’s in a curry of course) so I can offer no advise. It’s very much trial and error with this fungus. It’s up to you to see how you can make it a ‘chicken substitute’, and being a very ‘tofu-like’ flesh, it has great potential in the kitchen. You can save some for later too because it stores well in the freezer for a while. Finally (and as always), be careful trying any mushroom/fungus (you understand is edible) for the first time, as their may be an unwelcome reaction. Only try a small portion at a time and give yourself a generous few hours to see how you go. I would recommend that Chicken of the Woods found on Yew trees to be avoided altogether. It has been known to cause severe gastric upset, dizziness and general nausea. That’s not what you want! The typical Orange/Yellow colours of the Sulphur Polypore (Chicken of the Woods). The thick white flesh of the younger brackets are best for cooking. Another example of the fungus; layered in the usual way but more fleshy and rounded. 10 – 40cm accross. Fan shaped / Semi-circular. Irregular margin. In large tierd groups. Yellow/Orange. Thick and fleshy. Turns straw/white coloured with age. Uneven upper surface – usually lumpy-like. Very tiny pores (circular or ovate). Sulphur yellow in colour. On deciduous trees. Common on Oak, Cherry, Poplar and Willow. Thoes found on Yew known to be poisonous. Late spring to autumn. Edible when young and fresh. Best cooking tips from Germany & North America. • Usually tough or hard and woody. Some softer and edible. I have the trees location etched in my mind. I will be back again to be sure. Hope you find some Chicken of the Woods soon. Fantastic John, I, too recently found this fungus in early June but completely by chance and I could not believe my luck! We were out camping so foraged some wild garlic to go with it too. I felt like such an adventurer! That sounds great. It’s good to live off the land like that. I hope your cooking went better than my lousy attempts! I’m sure I’ll get better. I hope you get lucky. It’s one of those few mushrooms where you have to look ‘up’ for! Hello. I think I found some of these yesterday, so I’ve sent you some photographs via your ‘contact’ feature to confirm if possible. Though I say so myself, the photo’s I sent show the colours of the mushroom beautifully, so please feel free to use them if you wish. It is the Chicken of the Woods. Nice find indeed. I may add these pictures to the post (and I will credit you of course). Thank you. Thank you for the confirmation, and please feel free to use the pics if you wish. I will report on how they taste once I get the chance to pick some, assuming the local kids haven’t smashed them all! Finally, if I may leave a cooking tip; if you find that some mushrooms are too bitter for your taste despite being perfectly edible, soaking them in milk for 3-4 hours prior to cooking neutralises much of the bitterness (the longer the soak the more the bitterness is reduced) leaving the delicious mushroominess for you to enjoy. That’s a good tip. Thanks. I use this technique with the Beef Steak Fungus. Works a treat. Well, I went back and managed to get some of the younger growths to try. I cut them into thick slices and gently pan-fried them in butter along with a couple of monkfish steaks and a twist of black pepper. Absolutely delicious; meaty and earthy with just a hint of bitterness that complimented the sweetness of the fish perfectly. That sounds lovely and such a good recipe. It’s good to balance the slight bitterness with sweetness from other foods. Good stuff. Hi Baja – I read your other feedback below. You most possibly have found the Giant Polypore. See my post on it here: https://www.mushroomdiary.co.uk/2011/10/giant-polypore. It does break up easily, yes. There are no deadly bracket fungi – Most of them just taste awful actually and will probably do you no good. But the odd few are worth checking out. Great news thanks a lot, think I’ll be sampling next year! ..also, the stems – about 2/3 cm thick, have a few tiny hairs scattered about (or kind of upturned scales)..i know this is not common for smaller chanterelles, but maybe have developed over time.